The Hoover Platinum Collection Professional-Strength Carpet-and-Upholstery Detergent is excellent at removing dirt and different kinds of stains like coffee, cosmetics, red wine, and more. It can be used with all deep-cleaning machines that we have reviewed and more, and its potent formula is strong enough to take on heavy-traffic areas. This is really good stuff, basically. This professional-strength formula has been approved by the Carpet & Rug Institute and it comes in a fresh linen scent that leaves the room smelling clean and pleasant. When used with your Hoover deep cleaner, your carpets and upholstery are sure to look as good as new. Read on to learn more about this detergent. To date, this product has only garnered 49 customer reviews on Amazon.com. A large chunk of customer feedbacks were positive, with most users giving the product high ratings for its cleaning efficiency. Product arrived in bad condition – Unfortunately for some customers, their containers had leaked when it arrived on their doorstep. But Amazon was quick to take action and send replacements. Too expensive and easily runs out – Some reviewers also felt that this product is a bit too pricey, considering that it doesn’t last very long if you follow the recommended amount to use for each cleaning. One bottle is good for small spaces, but usually not enough for larger rooms. Really cleans – Customers were pleased to report that this detergent really does what it’s supposed to do. It effectively removes dirt and stains—even stains that are a few years old! And it certainly doesn’t hurt that it leaves the room smelling fresh too. Soft on carpets – Most detergents have a reputation for leaving your carpets stiff. 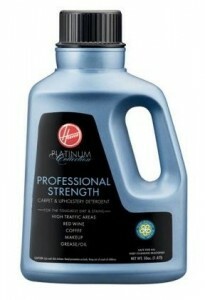 The Hoover Platinum Collection Professional-Strength detergent is an exception. It seems to condition the fabric as it cleans, leaving your carpets nice and soft to the touch. All in all, the Hoover Platinum Collection Professional-Strength Carpet-and-Upholstery Detergent seems like a high quality product. It may be quite expensive as some users have commented, but it definitely delivers.